You are here: Home / Special Guest Blogger / Karen Blackwood: So what does history have to do with mental health? So what does history have to do with mental health? Taking place throughout May each year, South Australia’s History Festival is a state-wide festival of history. Making connections is what the History Festival is all about: connections between people and place, between past and present, between different ideas and perspectives. In 2019, the History Festival is happening from 27 April to 31 May. 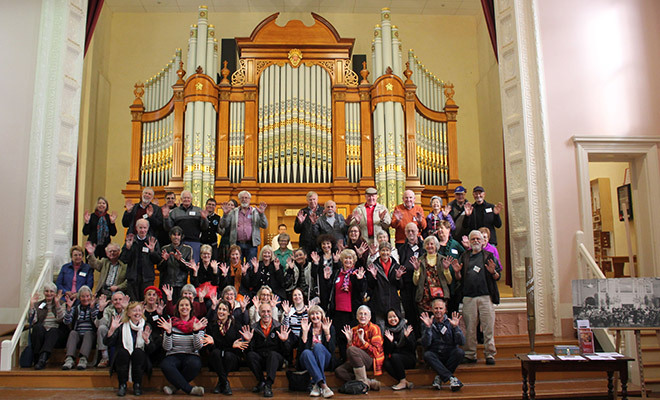 Events in the festival are produced by South Australian organisations of all shapes and sizes: from small, volunteer-run community groups, to large institutions and attractions. Events include anything from guided tours, exhibitions, open days and talks, to performances, dinners, boat trips, workshops – just about anything is possible. For Mental Health Week in October 2018, we decided to take a look at how participating in the History Festival might have a positive impact on wellbeing. We were inspired by the Five Ways to Wellbeing in Nature* campaign which encourages us to focus on looking after our mental health and wellbeing by getting a regular dose of nature. The Five Ways** are: connect, take notice, be active, keep learning and give. We like that they’re simple and inviting, and it occurred to us that the History Festival provides numerous opportunities to undertake some of these simple actions to improve personal wellbeing. After the 2018 History Festival, we asked visitor survey respondents what they appreciated about the festival. Many respondents expressed the social benefits of attending events: for some it’s a chance to meet new people, and others enjoy heading out to events with family or friends. One survey respondent noticed that ‘people act differently at these functions, they talk to each other and strangers’. The subject matter of the event is a great conversation starter. In the quieter moments – waiting for the event to start or, in the case of a tour, moving to the next location – people often strike up a conversation and connect about what they’ve learned or noticed. Many event organisers plan their events to finish up with a cuppa and a chance to chat once the formal part of the event is over. These moments of connection create the feeling of a ‘mini-community’ with others at the event. You are no longer a collection of strangers, but a group of people sharing an experience. In our busy lives, we pass through our suburbs, towns, regions or cities every day without paying much attention to what’s around us. Many History Festival events help us to zoom in and focus attention on features we might have never noticed before. Then the next time we pass through, we’ll look at the same places with fresh eyes and a new perspective of our surroundings. The History Festival is a good time to learn more about Aboriginal histories and cultures. 2019 is the UN International Year of Indigenous Languages. Learning a few words in the local language can be a good starting point to gain a deeper understanding of the places around you and the rich histories attached to them. According to our feedback survey, tours were the most popular events in the 2018 program. Tours come in many forms, from the 26km Pioneer Women’s Trail walk from Hahndorf to Beaumont House, to exhibition tours, town tours, architecture tours, photography tours, self-guided walks and even bike tours. Most tours in the program offer some way to get out and get moving. Walking or catching public transport to events can also be a good way to add to your daily steps and give time to reflect on what you’ve seen and learned at events without having to think about traffic. Our audiences come from different backgrounds and generations, but they have one thing in common – a love of learning. Learning new things keeps the mind active and open. The range of events on offer during the History Festival means that you can choose something that you find interesting and learn through interactive experiences, which is a great alternative to traditional educational settings. A majority of events in the History Festival are run – or at least partly run ­– by volunteers. Volunteering is a popular way of giving time, enthusiasm and talents to a cause, community group or organisation that relies on such support to create events. In return, volunteering is a great way to develop social networks, pick up new skills and feel a sense of purpose. You can also give during the History Festival by making a donation or by simply showing up to support the event organisers and local community. 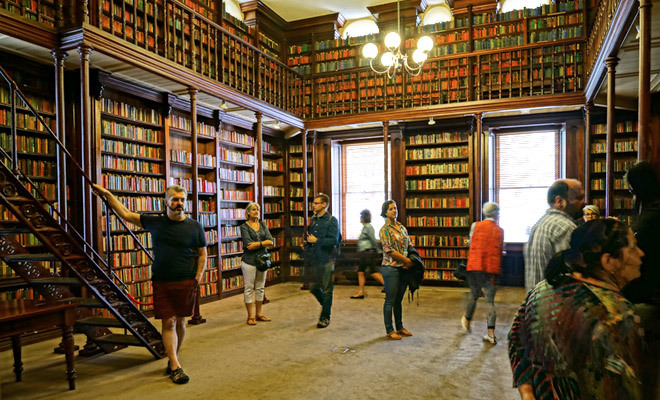 The 2019 History Festival opening weekend 27–29 April is Open Doors: three days of events focusing on heritage buildings and architectural history. You can find out about other events across the festival that might interest you in the Festival program to be released in the Advertiser and online on Saturday 6 April. Find out more at www.historyfestival.sa.gov.au or follow us on Facebook, Instagram and Twitter. So, whether it’s giving, learning, connecting, getting active, or taking notice there’s plenty of opportunities to a positive impact on your wellbeing during the History Festival. Karen is the History Festival Manager and an Administrative Officer within the Community Engagement division of History Trust of South Australia. She works with the History Trust’s public programs including South Australia’s History Festival. Karen also facilitates public access to the South Australian Government Photographic Collection and assists with the coordination of the History Trust Library. ** The original Five Ways to Wellbeing concept was developed in 2008 by the UK’s New Economics Foundation. The have since been embraced and adopted worldwide.